Pacific City, Oregon (May 2, 2017)—A 21st birthday only comes once in a lifetime and this week is Pelican Brewing Company’s turn to celebrate! In honor of this momentous occasion, Pelican reflects on over 400 prestigious awards and celebrates with the first Pelican brew—and first Gold medal winner—ever imagined by founding brewmaster Darron Welch. Welcome back from the Pelican vault Doryman’s Dark Ale—available on draft starting May 4 at all Pelican venues. Doryman’s Dark Ale was adapted from Welch’s prize-winning homebrew recipe and showcases his love of history with one of the earliest beer styles directly attributed to American craft brewers. Doryman’s, which was Pelican’s first Gold medal winner, took the prize at the 1999 Great American Beer Festival in the American Brown Ale category. This rich toasty brew forever holds a special place in Pelican’s heart, no matter the birthday they celebrate. Pelican celebrates its auspicious day and the return of Doryman’s this Thursday, May 4, tapping kegs of this special edition dark ale for a toast at 5p. The public is welcome to join in the revelry at any Pelican location—Pacific City, Cannon Beach, Tillamook. Pelican beer fanatics can reserve a case of the 22 oz. 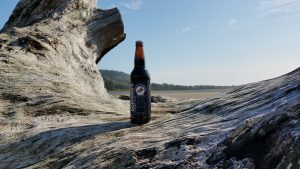 bottle 12-pack limited production ale which will be available for pick-up only at all Pelican locations: Pacific Beach, Tillamook and Cannon Beach brewpubs. With consistent growth and demand for its products, Pelican recently increased brewing and bottling capacity at its Tillamook facility to over 38,000 barrels and opened a new brewpub last year in Cannon Beach. New Pelican facilities enable the highly-decorated brewer to continue its exploration of special brews like the small batch Lone Pelican Series and Barrel-aged Collection. Pelican was born at the beach 21 years ago as a small, stand alone brewpub in a small town on the Oregon coast—Pacific City. Pacific City is still a small town, but with consistent growth and demand for its products, Pelican sales are up more than 500% from 3,500 barrels in 2013 to 18,000 barrels this year. The company recently doubled its brewing and bottling capacity at its Tillamook facility and opened a new brewpub in Cannon Beach. Pelican also recently won a bronze medal at the World Brew Cup℠ and eight medals including Champion Medium International Brewery at the Australian International Beer Awards.